Solar LED lights are essentials in homes that are particular about security and ambience. Finding the right solar spot light can be a daunting task since there are lots of them in the market. This is why we have decided to write about how you can choose the right solar spot lights. Importantly, we also reviewed some of the best solar spot lights for you. 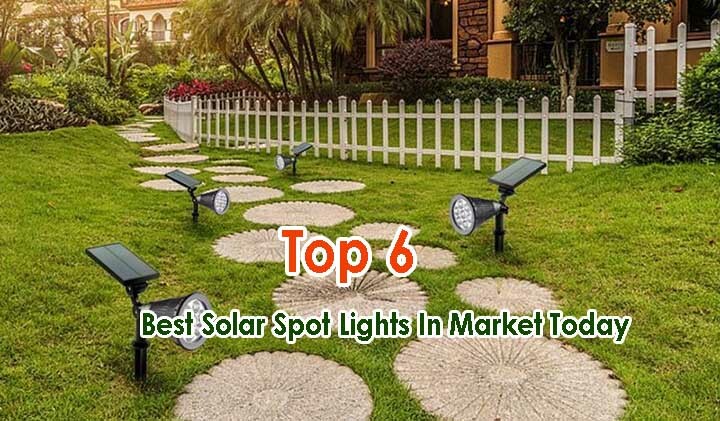 How To Choose The Best Solar Spot lights? 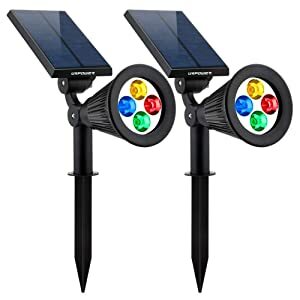 Solar spot lights vary according to uses and to ensure that you choose the best solar spot lights, we will be giving you tips on what to look out for. Whilst we won’t be able to cover all the features you can consider, we are sure our tips will go a long way to help you reach your purchase decision. Importantly, you should choose solar spot lights that you can easily install and this can is visible due to the absence of wiring. 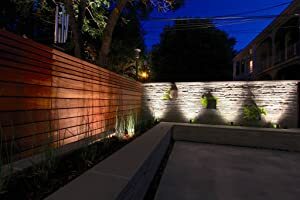 In addition, if you have a preference of your light shining from above, choose solar lights that you can mount on walls. 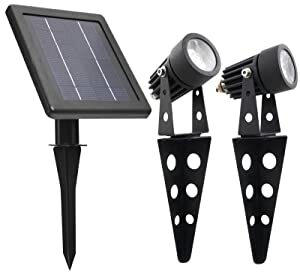 Also, if you prefer your lights to shine from down up, buy solar lights with spikes that you will stick in the ground. Sizes of solar lights vary and you must note that because the solar light is bigger doesn’t mean that it is better. If you are trying to make your solar light discreet, then you should choose a smaller solar light. Storage batteries are one of the most important features of solar lights and this is because they are where the energy from the sun is being stored. When solar panels collect the energy from the sun during the day, the batteries are what will ensure that you get to use the light at night. This is why you should choose batteries that can hold a charge for long. The different batteries available for purchase include; lead-acid batteries, nickel metal hydride batteries and nickel-cadmium batteries. The best type of solar battery remains the nickel-cadmium batteries. This is because they are cheap, easy to install and known to hold a charge for long. Besides, ensure that you also choose a battery with high capacity. This is because; the higher the capacity, the longer they will serve you when you need the light. Another feature you might want to consider is sensors which include motion detectors and light sensors. The motion detector sensors work by turning the light on immediately it detects movement around its radius. This is very good for security and you can have a heads up if there is any unwanted movement around. Also, the light sensor works by turning on the light immediately the solar light senses darkness and turns on immediately it senses light. This helps to end the stress of having to turn on or off the solar lights yourself. Apart from the general use of solar spot light which is for lighting the environment, they have some other benefits. We will be highlighting these benefits in subsequent paragraphs. Solar spot lights are very good for security purpose and this is because they help light up the environment. Also, some solar spot lights have motion detectors that turn on after detecting movements around it. This makes it easy to spot intruders early. When trying to put a focus on specific structures in your house, then solar spot lights are a good way to. This is because they are very bright and you do not have to worry about extra electricity costs because you want to put attention on structures. Another fantastic use of solar spot lights is when there is an unprecedented blackout. With solar spot lights, you can rest assured that you will have the surroundings lit up when the blackouts happen. Also, it is possible for you to take the solar spot lights into your house to brighten the interiors. With 200 lumens of output, the Nekteck Solar powered garden spotlight is one of the brightest solar spotlights you could find. It is useful if you want to place attention on any feature in the surrounding. You can also use it as security lights for the surroundings. With the Nekteck solar spotlights, you can get bright warm lights for approximately 10 hours although; this depends on the amount of sunlight available in the day. Besides, you have a choice to choose a set with bright white lights or multi-coloured lights. This helps to serve customers with varying light preferences. One good feature of the Nekteck is its durability and this is due to its weather resistant plastic body. 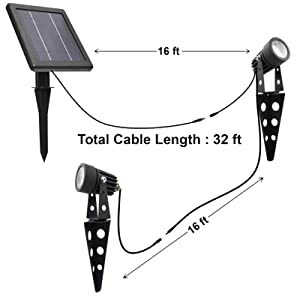 This helps ensure that you can use the solar light in any weather condition without worry. Besides, with a very big solar panel, the solar light can easily absorb more light which further aids charging of the appliance. You can get install the spot lights in two ways depending on your preference; you can either mount it on the wall or stick it into the ground. But, when sticking it into the ground, ensure that the hole isn’t dug with the solar light to avoid breaking it. Also, the solar light has two modes: The bright light mode and the dim light mode. This helps you to be able to manage how you consume battery power. However, to get the best from the solar light, you must remove the protective film on the solar light. Finally, ensure that you place the solar light in a place where there is direct sunlight. Looking for an extremely bright solar spot light? Then the DrawGreen Bright LED Solar Spotlight is for you. This is because it has a 1400 lumen output which is equivalent to 110 watts. In addition, it has an optics grade PMMA lens that is responsible for making the light brighter. With a range of over 40ft, you can rest assured that the light will cover almost everywhere you need it to cover. Also, it takes the light an average of 6 hours to charge when it is sunny. This feature also ensures that the solar lights get charged enough during the day when there is no sun. Furthermore, durability was put into consideration by the manufacturers and this is reflected by its high strength aluminium alloy shell. In addition, this solar light has a waterproof IP66 feature that can withstand any harsh weather condition. The solar batteries of the solar lights are replaceable which in a way makes it safer for use. Interestingly, the lifespan of the DrawGreen Solar Spotlight is 50,000 hours which is more than most of the solar spot lights available. Also, the solar light has an inbuilt PIR motion detection sensor that can detect up to 25ft away and with a range of 120 degrees. Finally, to attest to their durability, the manufacturers placed a 160-week warranty on the product. They also provide a 100% replacement on the product in case of product quality problems. It has a short motion sensing range. The Mini 50X Twin Solar Spotlight has 60-100 lumen output per feature. It also has a high power warm light with special magnifier lenses. These lenses are very clear and they are scratch resistant and this ensures that you get to use them for a long time. Furthermore, for durability, the solar lights are made out of cast aluminium which doesn't only ensure that it lasts but also makes it lightweight. The lightweight feature allows the user to move and install it anywhere easily. In addition, to ensure that the light covers a large area, the manufacturer made the output angle to be at a 45-degree angle. For easy usage, the manufacturer also included a remote that controls both the solar panel and the battery. Besides, the solar light runs on a powerful lithium battery that can last up to 10 hours depending on how well it is charged. Although, the duration of the battery also depends on which brightness setting is used. Users also have the option of two types of installation. They can choose to put the stake in the ground or mount the solar lights on walls. 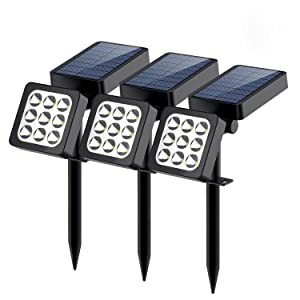 Also, these solar lights are built to withstand any weather condition and this is due to its IP55 feature. Finally, with the Mini 50X solar LED spotlight, you are assured of having a solar light with a beautiful black finish that can serve as beautification for your surroundings. The URPOWER Solar spotlight is a spotlight with 50 lumens each and 200 lumens output in total. It also features an automated switch that turns on itself when it is getting dark and off when the sun starts to rise. This helps to eliminate the stress of having to physically put on and off the solar light. Furthermore, the solar light has an inbuilt 18650 lithium rechargeable battery with 2200mAh capacity. This battery ensures that the light stays on for approximately 8 hours when fully charged. Besides, the multicolour feature of the solar light is also an interesting feature potential users should look at. 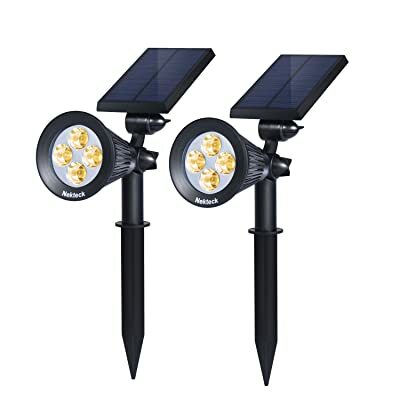 In addition, the solar light is adjustable which allows you to get a good angle for direct sunlight. However, you should note that this solar light can only be adjusted up and down and not sideways. Durability was also put into consideration and this is because of its waterproof feature. This ensures that you can use the spot light all year round without worry. 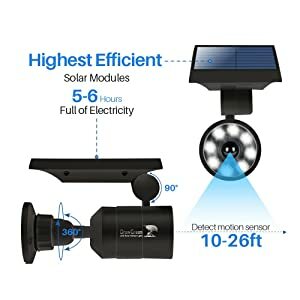 Finally, to install the URPOWER's solar spotlight requires no special technique because all you need to do is mount it on the wall or place the stake in the ground. With 9 LED lights, the Erligpowht Solar spotlight assures users very bright lights at night. 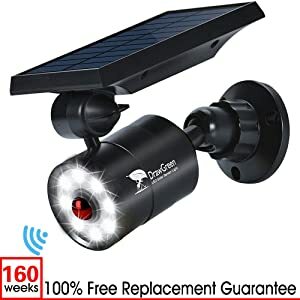 This solar spotlight is a fantastic option for those that are security conscious. Also, the solar light panel and light itself is adjustable which makes it easier to maximize the sun position for charging. 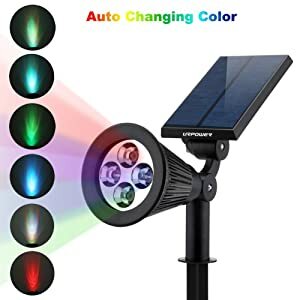 In addition, the Erligpowht Solar spotlight has 2 different light modes to suit your usage or preference which are the high light mode and the dim light mode. The dim light is particularly useful in situations where you want to minimize battery usage. Installation of this solar light is very easy and this is because it doesn't require any wiring. All you have to do is screw them to the wall or dig the ground and place the stake in it. 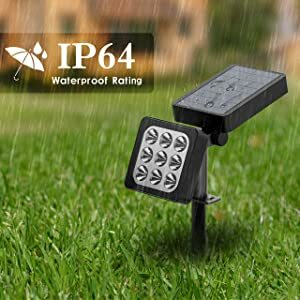 Furthermore, this solar light has an IP64 waterproof feature that makes it suitable for any weather condition. Also, to get the best of the solar light, ensure that they are well charged before use. Finally, the solar light has light sensors that automatically turn on the light when it is becoming dark and off when it detects light. OPERNEE Motion Sensor 6 LED landscape light is a solar spotlight with 50 lumens output each and 300 in total. It is suitable for your walkways, gardens patios and even front doors. It has a fantastic PIR motion sensor that enables it to light up when it detects the movement of both animals and humans. Interestingly, the PIR sensor has a range of about 25 meters which is quite impressive. Also, the light has two modes namely; high brightness and low brightness which gives the user a choice on how they want the light to shine through the night. 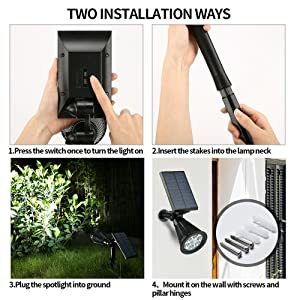 Furthermore, to install this solar spot light is very easy and you have a choice to either use the detachable ground spikes or mount the light on the wall. Also, the solar panel can be adjusted for up to 180 degrees in order for the solar lights to get a better angle in receiving sunlight for charging. Finally, the lighting can also be adjusted for up to 90 degrees for a better light shine angle. 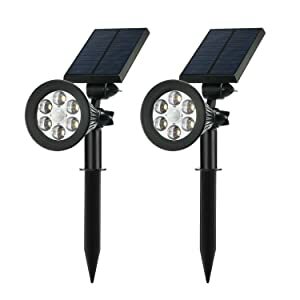 We have come to the conclusion of this article and we assure you that we have reviewed the best solar spot lights available for sale. However, from the lot we reviewed, we have reached a conclusion that the Nekteck Solar Powered Garden Spotlight trumps the rest. This is due to its high lumen output, its durability and its sleek design among others. You can also use it as security lights for the surroundings. With the Nekteck solar spotlights, you can get bright warm lights for approximately 10 hours although; this depends on the amount of sunlight available in the day. Besides, you have a choice to choose a set with bright white lights or multi-coloured lights. This helps to serve customers with varying light preferences.